You can both take the Leonardo Express train or the shuttle bus to Termini Station (they both leave every thirty minutes), then follow the instruction below. Take the shuttle bus to Termini Station, then follow the instruction below. The hotel is located in the limited traffic zone (ZTL), therefore we don’t recommend to get the car. 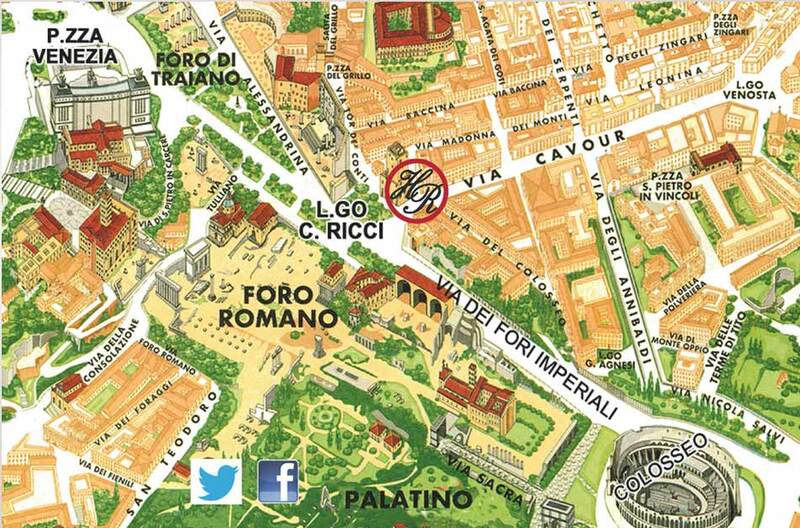 Anyway, after leaving the highway and the GRA follow the instruction to the historical centre or Termini Station. Once you get there, take via Cavour. Leave your car before the ZTL. Largo Corrado Ricci 32 is just 150 meters on the left. Public parking are available and charges apply. Take the metro line B (to Laurentina) and get off at the Colosseum. Walk through Via dei Fori Imperiali for 300 meters. Our hotel is in Largo Corrado Ricci 32. Just outside the station go to Piazza dei Cinquecento. Turn left and take Via Cavour for 1,5 km. Our hotel is in Largo Corrado Ricci 32.